Proprietary Name: Diclofenac Epolamine What is the Proprietary Name? Non-Proprietary Name: Diclofenac Epolamine What is the Non-Proprietary Name? Diclofenac Epolamine with NDC 59762-0411 is a a human prescription drug product labeled by Greenstone Llc. The generic name of Diclofenac Epolamine is diclofenac epolamine. The product's dosage form is patch and is administered via topical form. FDA Application Number: NDA021234 What is the FDA Application Number? Cardiovascular Thrombotic EventsNonsteroidal anti-inflammatory drugs (NSAIDs) cause an increased risk of serious cardiovascular thrombotic events, including myocardial infarction and stroke, which can be fatal. This risk may occur early in treatment and may increase with duration of use [see Warnings and Precautions (5.1)].DICLOFENAC EPOLAMINE TOPICAL PATCH 1.3% is contraindicated in the setting of coronary artery bypass graft (CABG) surgery [see Contraindications (4) and Warnings and Precautions (5.1)]. Gastrointestinal Bleeding, Ulceration, and PerforationNSAIDs cause an increased risk of serious gastrointestinal (GI) adverse events including bleeding, ulceration, and perforation of the stomach or intestines, which can be fatal. These events can occur at any time during use and without warning symptoms. Elderly patients and patients with a prior history of peptic ulcer disease and/or GI bleeding are at greater risk for serious GI events [see Warnings and Precautions (5.2)]. Status Post Coronary Artery Bypass Graft (CABG) SurgeryTwo large, controlled clinical trials of a COX-2 selective NSAID for the treatment of pain in the first 10–14 days following CABG surgery found an increased incidence of myocardial infarction and stroke. NSAIDs are contraindicated in the setting of CABG [see Contraindications (4)]. Post-MI PatientsObservational studies conducted in the Danish National Registry have demonstrated that patients treated with NSAIDs in the post-MI period were at increased risk of reinfarction, CV-related death, and all-cause mortality beginning in the first week of treatment. In this same cohort, the incidence of death in the first year post-MI was 20 per 100 person years in NSAID-treated patients compared to 12 per 100 person years in non-NSAID exposed patients. Although the absolute rate of death declined somewhat after the first year post-MI, the increased relative risk of death in NSAID users persisted over at least the next four years of follow-up.Avoid the use of DICLOFENAC EPOLAMINE TOPICAL PATCH 1.3% in patients with a recent MI unless the benefits are expected to outweigh the risk of recurrent CV thrombotic events. If DICLOFENAC EPOLAMINE TOPICAL PATCH 1.3% is used in patients with a recent MI, monitor patients for signs of cardiac ischemia. Strategies to Minimize the GI Risks in NSAID-Treated Patients:Use the lowest effective dosage for the shortest possible duration.Avoid administration of more than one NSAID at a time.Avoid use in patients at higher risk unless benefits are expected to outweigh the increased risk of bleeding. For such patients, as well as those with active GI bleeding, consider alternate therapies other than NSAIDs.Remain alert for signs and symptoms of GI ulceration and bleeding during NSAID therapy.If a serious GI adverse event is suspected, promptly initiate evaluation and treatment, and discontinue DICLOFENAC EPOLAMINE TOPICAL PATCH 1.3% until a serious GI adverse event is ruled out.In the setting of concomitant use of low-dose aspirin for cardiac prophylaxis, monitor patients more closely for evidence of GI bleeding [see Drug Interactions (7)]. Renal ToxicityLong-term administration of NSAIDs has resulted in renal papillary necrosis and other renal injury.Renal toxicity has also been seen in patients in whom renal prostaglandins have a compensatory role in the maintenance of renal perfusion. In these patients, administration of an NSAID may cause a dose-dependent reduction in prostaglandin formation and, secondarily, in renal blood flow, which may precipitate overt renal decompensation. Patients at greatest risk of this reaction are those with impaired renal function, dehydration, hypovolemia, heart failure, liver dysfunction, those taking diuretics and ACE inhibitors or ARBs, and the elderly. Discontinuation of NSAID therapy is usually followed by recovery to the pretreatment state.No information is available from controlled clinical studies regarding the use of DICLOFENAC EPOLAMINE TOPICAL PATCH 1.3% in patients with advanced renal disease. The renal effects of DICLOFENAC EPOLAMINE TOPICAL PATCH 1.3% may hasten the progression of renal dysfunction in patients with pre-existing renal disease.Correct volume status in dehydrated or hypovolemic patients prior to initiating DICLOFENAC EPOLAMINE TOPICAL PATCH 1.3% . Monitor renal function in patients with renal or hepatic impairment, heart failure, dehydration, or hypovolemia during use of DICLOFENAC EPOLAMINE TOPICAL PATCH 1.3% [see Drug Interactions (7)]. Avoid the use of DICLOFENAC EPOLAMINE TOPICAL PATCH 1.3% in patients with advanced renal disease unless the benefits are expected to outweigh the risk of worsening renal function. If DICLOFENAC EPOLAMINE TOPICAL PATCH 1.3% is used in patients with advanced renal disease, monitor patients for signs of worsening renal function. Adverse Events Leading to Discontinuation of Treatment In the controlled trials, 3% of patients in both the DICLOFENAC EPOLAMINE TOPICAL PATCH 1.3% and placebo patch groups discontinued treatment due to an adverse event. The most common adverse events leading to discontinuation were application site reactions, occurring in 2% of both the DICLOFENAC EPOLAMINE TOPICAL PATCH 1.3% and placebo patch groups. Application site reactions leading to dropout included pruritus, dermatitis, and burning. Localized ReactionsOverall, the most common adverse events associated with DICLOFENAC EPOLAMINE TOPICAL PATCH 1.3% treatment were skin reactions at the site of treatment. Table 1 lists all adverse events, regardless of causality, occurring in ≥ 1% of patients in controlled trials of DICLOFENAC EPOLAMINE TOPICAL PATCH 1.3% . A majority of patients treated with DICLOFENAC EPOLAMINE TOPICAL PATCH 1.3% had adverse events with a maximum intensity of "mild" or "moderate. "Table 1. Common Adverse Events (by body system and preferred term) in ≥ 1% of Patients treated with DICLOFENAC EPOLAMINE TOPICAL PATCH 1.3% or Placebo Patch The table lists adverse events occurring in placebo-treated patients because the placebo-patch was comprised of the same ingredients as DICLOFENAC EPOLAMINE TOPICAL PATCH 1.3% except for diclofenac. Adverse events in the placebo group may therefore reflect effects of the non-active ingredients.CategoryDiclofenacN=572Placebo N=564NPercentNPercentApplication Site Conditions 64117012 Pruritus315448 Dermatitis923<1 Burning2<181 OtherIncludes: application site dryness, irritation, erythema, atrophy, discoloration, hyperhidriosis, and vesicles.224153Gastrointestinal Disorders 499336 Nausea173112 Dysgeusia1023<1 Dyspepsia7181 OtherIncludes: gastritis, vomiting, diarrhea, constipation, upper abdominal pain, and dry mouth.153112Nervous System Disorders 132183 Headache71102 Paresthesia6181 Somnolence4161 Other Includes: hypoesthesia, dizziness, and hyperkinesias.413<1Foreign labeling describes that dermal allergic reactions may occur with DICLOFENAC EPOLAMINE TOPICAL PATCH 1.3% treatment. Additionally, the treated area may become irritated or develop itching, erythema, edema, vesicles, or abnormal sensation. Risk SummaryPublished literature reports that use of NSAIDs, including DICLOFENAC EPOLAMINE TOPICAL PATCH 1.3%, after 30 weeks' gestation increases the risk of premature closure of the fetal ductus arteriosus. Data from observational studies regarding potential embryofetal risks of NSAID use, including diclofenac, in women in the first or second trimester of pregnancy are inconclusive. Avoid use of NSAIDs, including DICLOFENAC EPOLAMINE TOPICAL PATCH 1.3%, in pregnant women starting at 30 weeks of gestation (third trimester) (see Clinical Considerations and Data).In animal reproduction studies, diclofenac epolamine administered orally to pregnant rats and rabbits during the period of organogenesis produced embryotoxicity at approximately 3 and 7 times, respectively, the topical exposure from the maximum recommended human dose (MRHD) of DICLOFENAC EPOLAMINE TOPICAL PATCH 1.3%. In rats, increased incidences of skeletal anomalies and maternal toxicity were also observed at this dose. Diclofenac epolamine administered orally to both male and female rats prior to mating and throughout the mating period, and during gestation and lactation in females produced embryotoxicity at doses approximately 3 and 7 times, respectively, the topical exposure from the MRHD (see Data). Based on animal data, prostaglandins have been shown to have an important role in endometrial vascular permeability, blastocyst implantation, and decidualization. In animal studies, administration of prostaglandin synthesis inhibitors such as diclofenac, resulted in increased pre- and post-implantation loss.The estimated background risk of major birth defects and miscarriage for the indicated population is unknown. All pregnancies have a background risk of birth defect, loss, or other adverse outcomes. In the U.S. general population, the estimated background risk of major birth defects and miscarriage in clinically recognized pregnancies is 2-4% and 15-20%, respectively. Fetal/Neonatal Adverse ReactionsAvoid use of NSAIDS in pregnant women after 30 weeks' gestation because NSAIDS, including DICLOFENAC EPOLAMINE TOPICAL PATCH 1.3%, can cause premature closure of the fetal ductus arteriosus. Human DataPublished literature reports that use of NSAIDS, including diclofenac, after 30 weeks' gestation may cause constriction of the patent ductus arteriosus and premature closure of the fetal ductus arteriosus. Animal DataPregnant Sprague Dawley rats were administered 1, 3, or 6 mg/kg diclofenac epolamine via oral gavage daily from gestation days 6 to 15. Maternal toxicity, embryotoxicity, and increased incidence of skeletal anomalies were noted with 6 mg/kg/day diclofenac epolamine, which corresponds to 3 times the maximum recommended daily exposure in humans based on a body surface area comparison. Pregnant New Zealand White rabbits were administered 1, 3, or 6 mg/kg diclofenac epolamine via oral gavage daily from gestation days 6 to 18. No maternal toxicity was noted; however, embryotoxicity was evident at 6 mg/kg/day group which corresponds to 7 times the maximum recommended daily exposure in humans based on a body surface area comparison.Male rats were orally administered diclofenac epolamine (1, 3, 6 mg/kg) for 60 days prior to mating and throughout the mating period, and females were given the same doses 14 days prior to mating and through mating, gestation, and lactation. Embryotoxicity was observed at 6 mg/kg diclofenac epolamine (3 times the maximum recommended daily exposure in humans based on a body surface area comparison), and was manifested as an increase in early resorptions, post-implantation losses, and a decrease in live fetuses. The number of live born and total born were also reduced as was F1 postnatal survival, but the physical and behavioral development of surviving F1 pups in all groups was the same as the deionized water control, nor was reproductive performance adversely affected despite a slight treatment-related reduction in body weight. Risk SummaryData from published literature reports with oral preparations of diclofenac indicate the presence of small amounts of diclofenac in human milk (see Data). There are no data on the effects on the breastfed infant, or the effects on milk production. The developmental and health benefits of breastfeeding should be considered along with the mother's clinical need for DICLOFENAC EPOLAMINE TOPICAL PATCH 1.3% and any potential adverse effects on the breastfed infant from the DICLOFENAC EPOLAMINE TOPICAL PATCH 1.3% or from the underlying maternal condition. DataOne woman treated orally with a diclofenac salt, 150 mg/day, had a milk diclofenac level of 100 mcg/L, equivalent to an infant dose of about 0.03 mg/kg/day. Diclofenac was not detectable in breast milk in 12 women using diclofenac (after either 100 mg/day orally for 7 days or a single 50 mg intramuscular dose administered in the immediate postpartum period). 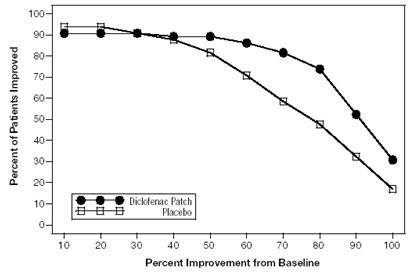 The relative bioavailability for DICLOFENAC EPOLAMINE TOPICAL PATCH 1.3% is <1% of a single 50 mg diclofenac tablet. FemalesBased on the mechanism of action, the use of prostaglandin-mediated NSAIDs, including DICLOFENAC EPOLAMINE TOPICAL PATCH 1.3% may delay or prevent rupture of ovarian follicles, which has been associated with reversible infertility in some women [see Clinical Pharmacology (12.1)]. Published animal studies have shown that administration of prostaglandin synthesis inhibitors has the potential to disrupt prostaglandin- mediated follicular rupture required for ovulation. Small studies in women treated with NSAIDs have also shown a reversible delay in ovulation. Consider withdrawal of NSAIDs, including DICLOFENAC EPOLAMINE TOPICAL PATCH 1.3%, in women who have difficulties conceiving or who are undergoing investigation of infertility. AbsorptionFollowing a single application of the DICLOFENAC EPOLAMINE TOPICAL PATCH 1.3% on the upper inner arm, peak plasma concentrations of diclofenac (range 0.7 – 6 ng/mL) were noted between 10 – 20 hours of application. Plasma concentrations of diclofenac in the range of 1.3 – 8.8 ng/mL were noted after five days with twice-a-day DICLOFENAC EPOLAMINE TOPICAL PATCH 1.3% application.Systemic exposure (AUC) and maximum plasma concentrations of diclofenac, after repeated dosing for four days with DICLOFENAC EPOLAMINE TOPICAL PATCH 1.3%, were lower (<1%) than after a single oral 50-mg diclofenac sodium tablet.The pharmacokinetics of DICLOFENAC EPOLAMINE TOPICAL PATCH 1.3% has been tested in healthy volunteers at rest or undergoing moderate exercise (cycling 20 min/h for 12 h at a mean HR of 100.3 bpm). No clinically relevant differences in systemic absorption were observed, with peak plasma concentrations in the range of 2.2 – 8.1 ng/mL while resting, and 2.7 – 7.2 ng/mL during exercise. DistributionDiclofenac has a very high affinity (>99%) for human serum albumin. Diclofenac diffuses into and out of the synovial fluid. Diffusion into the joint occurs when plasma levels are higher than those in the synovial fluid, after which the process reverses and synovial fluid levels are higher than plasma levels. It is not known whether diffusion into the joint plays a role in the effectiveness of diclofenac. MetabolismFive diclofenac metabolites have been identified in human plasma and urine. The metabolites include 4'-hydroxy-, 5-hydroxy-, 3'-hydroxy-, 4',5-dihydroxy- and 3'-hydroxy-4'-methoxy diclofenac. The major diclofenac metabolite, 4'hydroxy-diclofenac, has very weak pharmacologic activity. The formation of 4'-hydroxy diclofenac is primarily mediated by CPY2C9. Both diclofenac and its oxidative metabolites undergo glucuronidation or sulfation followed by biliary excretion. Acylglucuronidation mediated by UGT2B7 and oxidation mediated by CPY2C8 may also play a role in diclofenac metabolism. CYP3A4 is responsible for the formation of minor metabolites, 5-hydroxy and 3'-hydroxy- diclofenac. 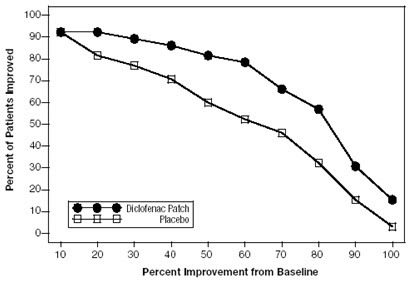 ExcretionThe plasma elimination half-life of diclofenac after application of DICLOFENAC EPOLAMINE TOPICAL PATCH 1.3% is approximately 12 hours. Diclofenac is eliminated through metabolism and subsequent urinary and biliary excretion of the glucuronide and the sulfate conjugates of the metabolites. Little or no free unchanged diclofenac is excreted in the urine. Approximately 65% of the dose is excreted in the urine and approximately 35% in the bile as conjugates of unchanged diclofenac plus metabolites. Specific PopulationsThe pharmacokinetics of DICLOFENAC EPOLAMINE TOPICAL PATCH 1.3% has not been investigated in children, patients with hepatic or renal impairment, or specific racial groups. Aspirin: When NSAIDs were administered with aspirin, the protein binding of NSAIDs were reduced, although the clearance of free NSAID was not altered. The clinical significance of this interaction is not known. See Table 1 for clinically significant drug interactions of NSAIDs with aspirin [see Drug Interactions (7)]. CarcinogenesisLong-term studies in animals have not been performed to evaluate the carcinogenic potential of either diclofenac epolamine or DICLOFENAC EPOLAMINE TOPICAL PATCH 1.3%. MutagenesisDiclofenac epolamine is not mutagenic in Salmonella typhimurium strains, nor does it induce an increase in metabolic aberrations in cultured human lymphocytes, or the frequency of micronucleated cells in the bone marrow micronucleus test performed in rats. Impairment of FertilityMale and female Sprague Dawley rats were administered 1, 3, or 6 mg/kg/day diclofenac epolamine via oral gavage (males treated for 60 days prior to conception and during mating period, females treated for 14 days prior to mating through day 19 of gestation). Diclofenac epolamine treatment with 6 mg/kg/day resulted in increased early resorptions and post-implantation losses; however, no effects on the mating and fertility indices were found. The 6 mg/kg/day dose corresponds to 3 times the maximum recommended daily exposure in humans based on a body surface area comparison. Cardiovascular Thrombotic EventsAdvise patients to be alert for the symptoms of cardiovascular thrombotic events, including chest pain, shortness of breath, weakness, or slurring of speech, and to report any of these symptoms to their health care provider immediately [see Warnings and Precautions (5.1)]. Gastrointestinal Bleeding, Ulceration, and PerforationAdvise patients to report symptoms of ulcerations and bleeding, including epigastric pain, dyspepsia, melena, and hematemesis to their health care provider. In the setting of concomitant use of low-dose aspirin for cardiac prophylaxis, inform patients of the increased risk for and the signs and symptoms of GI bleeding [see Warnings and Precautions (5.2)]. HepatotoxicityInform patients of the warning signs and symptoms of hepatotoxicity (e.g., nausea, fatigue, lethargy, pruritus, diarrhea, jaundice, right upper quadrant tenderness, and "flu-like" symptoms). If these occur, instruct patients to stop DICLOFENAC EPOLAMINE TOPICAL PATCH 1.3% and seek immediate medical therapy [see Warnings and Precautions (5.3)]. Serious Skin ReactionsAdvise patients to stop DICLOFENAC EPOLAMINE TOPICAL PATCH 1.3% immediately if they develop any type of rash and to contact their healthcare provider as soon as possible [see Warnings and Precautions (5.9)]. Premature Closure of the Fetal Ductus ArteriosusAdvise pregnant women to avoid use of DICLOFENAC EPOLAMINE TOPICAL PATCH 1.3% and other NSAIDs starting at 30 weeks' gestation because of the risk of the premature closure of the fetal ductus arteriosus. Advise females of reproductive potential to contact their healthcare provider with a known or suspected pregnancy [see Warnings and Precautions (5.10) and Use in Specific Populations (8.1)]. Avoid Concomitant Use of NSAIDsInform patients that the concomitant use of DICLOFENAC EPOLAMINE TOPICAL PATCH 1.3% with other NSAIDs or salicylates (e.g., diflunisal, salsalate) is not recommended due to the increased risk of gastrointestinal toxicity, and little or no increase in efficacy [see Warnings and Precautions (5.2) and Drug Interactions (7)]. Alert patients that NSAIDs may be present in "over the counter" medications for treatment of colds, fever, or insomnia. Use of NSAIDS and Low-Dose AspirinInform patients not to use low-dose aspirin concomitantly with DICLOFENAC EPOLAMINE TOPICAL PATCH 1.3% until they talk to their healthcare provider [see Drug Interactions (7)]. Eye ExposureInstruct patients to avoid contact of DICLOFENAC EPOLAMINE TOPICAL PATCH 1.3% with the eyes and mucosa. Advise patients that if eye contact occurs, immediately wash out the eye with water or saline and consult a physician if irritation persists for more than an hour [see Warnings and Precautions (5.15)]. Special Application InstructionsInstruct patients that, if DICLOFENAC EPOLAMINE TOPICAL PATCH 1.3% begins to peel-off, the edges of the patch may be taped down. If problems with adhesion persist, patients may overlay the patch with a mesh netting sleeve, where appropriate (e.g. to secure patches applied to ankles, knees, or elbows). The mesh netting sleeve (e.g. Curad® Hold Tite™, Surgilast® Tubular Elastic Dressing) must allow air to pass through and not be occlusive (non-breathable).Instruct patients not to apply DICLOFENAC EPOLAMINE TOPICAL PATCH 1.3% to non-intact or damaged skin resulting from any etiology e.g. exudative dermatitis, eczema, infected lesion, burns or wounds. Instruct patients not to wear a DICLOFENAC EPOLAMINE TOPICAL PATCH 1.3% when bathing or showering.Instruct patients to wash hands after applying, handling or removing the patch. DICLOFENAC EPOLAMINE TOPICAL PATCH 1.3% is indicated for the topical treatment of acute pain due to minor strains, sprains, and contusions. Use the lowest effective dosage for the shortest duration consistent with individual patient treatment goals [see Warnings and Precautions (5)].The recommended dose of DICLOFENAC EPOLAMINE TOPICAL PATCH 1.3% is one (1) patch to the most painful area twice a day. Inform patients that, if DICLOFENAC EPOLAMINE TOPICAL PATCH 1.3% begins to peel-off, the edges of the patch may be taped down. If problems with adhesion persist, patients may overlay the patch with a mesh netting sleeve, where appropriate (e.g. to secure patches applied to ankles, knees, or elbows). The mesh netting sleeve (e.g. Curad® Hold Tite™, Surgilast® Tubular Elastic Dressing) must allow air to pass through and not be occlusive (non-breathable).Do not apply DICLOFENAC EPOLAMINE TOPICAL PATCH 1.3% to non-intact or damaged skin resulting from any etiology e.g. exudative dermatitis, eczema, infected lesion, burns or wounds. Do not wear a DICLOFENAC EPOLAMINE TOPICAL PATCH 1.3% when bathing or showering.Wash your hands after applying, handling or removing the patch. Avoid eye contactDo not use combination therapy with DICLOFENAC EPOLAMINE TOPICAL PATCH 1.3% and an oral NSAID unless the benefit outweighs the risk and conduct periodic laboratory evaluations. Diclofenac Epolamine Patch (10 × 14 cm) containing 180 mg of diclofenac epolamine, embossed with GREENSTONE 1.3%. DICLOFENAC EPOLAMINE TOPICAL PATCH 1.3% is contraindicated in the following patients:Known hypersensitivity (e.g., anaphylactic reactions and serious skin reactions) to diclofenac or any components of the drug product [see Warnings and Precautions (5.7, 5.9)]History of asthma, urticaria, or other allergic-type reactions after taking aspirin or other NSAIDs. Severe, sometimes fatal, anaphylactic reactions to NSAIDs have been reported in such patients [see Warnings and Precautions (5.7, 5.8)]In the setting of coronary artery bypass graft (CABG) surgery [see Warnings and Precautions (5.1)]DICLOFENAC EPOLAMINE TOPICAL PATCH 1.3% is contraindicated for use on non-intact or damaged skin resulting from any etiology, including exudative dermatitis, eczema, infection lesions, burns or wounds. Clinical trials of several COX-2 selective and nonselective NSAIDs of up to three years duration have shown an increased risk of serious cardiovascular (CV) thrombotic events, including myocardial infarction (MI) and stroke, which can be fatal. Based on available data, it is unclear that the risk for CV thrombotic events is similar for all NSAIDs. The relative increase in serious CV thrombotic events over baseline conferred by NSAID use appears to be similar in those with and without known CV disease or risk factors for CV disease. However, patients with known CV disease or risk factors had a higher absolute incidence of excess serious CV thrombotic events, due to their increased baseline rate. Some observational studies found that this increased risk of serious CV thrombotic events began as early as the first weeks of treatment. The increase in CV thrombotic risk has been observed most consistently at higher doses.To minimize the potential risk for an adverse CV event in NSAID-treated patients, use the lowest effective dose for the shortest duration possible. Physicians and patients should remain alert for the development of such events, throughout the entire treatment course, even in the absence of previous CV symptoms. Patients should be informed about the symptoms of serious CV events and the steps to take if they occur.There is no consistent evidence that concurrent use of aspirin mitigates the increased risk of serious CV thrombotic events associated with NSAID use. The concurrent use of aspirin and an NSAID, such as diclofenac, increases the risk of serious gastrointestinal (GI) events [see Warnings and Precautions (5.2)]. NSAIDs, including diclofenac, cause serious gastrointestinal (GI) adverse events including inflammation, bleeding, ulceration, and perforation of the esophagus, stomach, small intestine, or large intestine, which can be fatal. These serious adverse events can occur at any time, with or without warning symptoms, in patients treated with NSAIDs.Only one in five patients who develop a serious upper GI adverse event on NSAID therapy is symptomatic. Upper GI ulcers, gross bleeding, or perforation caused by NSAIDs occurred in approximately 1% of patients treated for 3-6 months, and in about 2%-4% of patients treated for one year. However, even short-term NSAID therapy is not without risk. In clinical trials of oral diclofenac containing products, meaningful elevations (i.e., more than 3 times the ULN) of AST (SGOT) were observed in about 2% of approximately 5,700 patients at some time during diclofenac treatment (ALT was not measured in all studies).In a large open-label, controlled trial of 3,700 patients treated with oral diclofenac sodium for 2-6 months, patients were monitored first at 8 weeks and 1,200 patients were monitored again at 24 weeks. Meaningful elevations of ALT and/or AST occurred in about 4% of the 3,700 patients and included marked elevations (greater than 8 times the ULN) in about 1% of the 3,700 patients. In that open-label study, a higher incidence of borderline (less than 3 times the ULN), moderate (3-8 times the ULN), and marked (greater than 8 times the ULN) elevations of ALT or AST was observed in patients receiving diclofenac when compared to other NSAIDs. Elevations in transaminases were seen more frequently in patients with osteoarthritis than in those with rheumatoid arthritis. Almost all meaningful elevations in transaminases were detected before patients became symptomatic. Abnormal tests occurred during the first 2 months of therapy with diclofenac in 42 of the 51 patients in all trials who developed marked transaminase elevations. In postmarketing reports, cases of drug-induced hepatotoxicity have been reported in the first month, and in some cases, the first 2 months of therapy, but can occur at any time during treatment with diclofenac. Postmarketing surveillance has reported cases of severe hepatic reactions, including liver necrosis, jaundice, fulminant hepatitis with and without jaundice, and liver failure. Some of these reported cases resulted in fatalities or liver transplantation.In a European retrospective population-based, case-controlled study, 10 cases of diclofenac associated drug-induced liver injury with current use compared with non-use of diclofenac were associated with a statistically significant 4-fold adjusted odds ratio of liver injury. 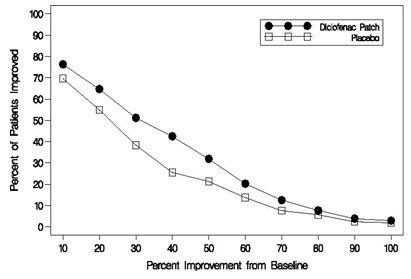 In this particular study, based on an overall number of 10 cases of liver injury associated with diclofenac, the adjusted odds ratio increased further with female gender, doses of 150 mg or more, and duration of use for more than 90 days.Physicians should measure transaminases at baseline and periodically in patients receiving long-term therapy with diclofenac, because severe hepatotoxicity may develop without a prodrome of distinguishing symptoms. The optimum times for making the first and subsequent transaminase measurements are not known. Based on clinical trial data and postmarketing experiences, transaminases should be monitored within 4 to 8 weeks after initiating treatment with diclofenac. However, severe hepatic reactions can occur at any time during treatment with diclofenac.If abnormal liver tests persist or worsen, if clinical signs and/or symptoms consistent with liver disease develop, or if systemic manifestations occur (e.g., eosinophilia, rash, abdominal pain, diarrhea, dark urine, etc. ), DICLOFENAC EPOLAMINE TOPICAL PATCH 1.3% should be discontinued immediately.Inform patients of the warning signs and symptoms of hepatotoxicity (e.g., nausea, fatigue, lethargy, diarrhea, pruritus, jaundice, right upper quadrant tenderness, and "flu-like" symptoms). If clinical signs and symptoms consistent with liver disease develop, or if systemic manifestations occur (e.g., eosinophilia, rash, etc. ), discontinue DICLOFENAC EPOLAMINE TOPICAL PATCH 1.3% immediately, and perform a clinical evaluation of the patient.To minimize the potential risk for an adverse liver related event in patients treated with DICLOFENAC EPOLAMINE TOPICAL PATCH 1.3%, use the lowest effective dose for the shortest duration possible. Exercise caution when prescribing DICLOFENAC EPOLAMINE TOPICAL PATCH 1.3% with concomitant drugs that are known to be potentially hepatotoxic (e.g., acetaminophen, antibiotics, anti-epileptics). NSAIDs, including DICLOFENAC EPOLAMINE TOPICAL PATCH 1.3%, can lead to new onset of hypertension or worsening of preexisting hypertension, either of which may contribute to the increased incidence of CV events. Patients taking angiotensin converting enzyme (ACE) inhibitors, thiazide diuretics, or loop diuretics may have impaired response to these therapies when taking NSAIDs [see Drug Interactions (7)].Monitor blood pressure (BP) during the initiation of NSAID treatment and throughout the course of therapy. The Coxib and traditional NSAID Trialists' Collaboration meta-analysis of randomized controlled trials demonstrated an approximately two-fold increase in hospitalizations for heart failure in COX-2 selective-treated patients and nonselective NSAID-treated patients compared to placebo-treated patients. In a Danish National Registry study of patients with heart failure, NSAID use increased the risk of MI, hospitalization for heart failure, and death.Additionally, fluid retention and edema have been observed in some patients treated with NSAIDs. Use of diclofenac may blunt the CV effects of several therapeutic agents used to treat these medical conditions (e.g., diuretics, ACE inhibitors, or angiotensin receptor blockers [ARBs]) [see Drug Interactions (7)].Avoid the use of DICLOFENAC EPOLAMINE TOPICAL PATCH 1.3% in patients with severe heart failure unless the benefits are expected to outweigh the risk of worsening heart failure. If DICLOFENAC EPOLAMINE TOPICAL PATCH 1.3% is used in patients with severe heart failure, monitor patients for signs of worsening heart failure. Diclofenac has been associated with anaphylactic reactions in patients with and without known hypersensitivity to diclofenac and in patients with aspirin-sensitive asthma [see Contraindications (4) and Warnings and Precautions (5.8)].Seek emergency help if an anaphylactic reaction occurs. A subpopulation of patients with asthma may have aspirin-sensitive asthma which may include chronic rhinosinusitis complicated by nasal polyps; severe, potentially fatal bronchospasm; and/or intolerance to aspirin and other NSAIDs. Because cross-reactivity between aspirin and other NSAIDs has been reported in such aspirin-sensitive patients, DICLOFENAC EPOLAMINE TOPICAL PATCH 1.3% is contraindicated in patients with this form of aspirin sensitivity [see Contraindications (4)]. When DICLOFENAC EPOLAMINE TOPICAL PATCH 1.3% is used in patients with preexisting asthma (without known aspirin sensitivity), monitor patients for changes in the signs and symptoms of asthma. NSAIDs, including diclofenac, can cause serious skin adverse reactions such as exfoliative dermatitis, Stevens-Johnson Syndrome (SJS), and toxic epidermal necrolysis (TEN), which can be fatal. These serious events may occur without warning. Inform patients about the signs and symptoms of serious skin reactions, and to discontinue the use of DICLOFENAC EPOLAMINE TOPICAL PATCH 1.3% at the first appearance of skin rash or any other sign of hypersensitivity. DICLOFENAC EPOLAMINE TOPICAL PATCH 1.3% is contraindicated in patients with previous serious skin reactions to NSAIDs [see Contraindications (4)]. Diclofenac may cause premature closure of the fetal ductus arteriosus. Avoid use of NSAIDs, including DICLOFENAC EPOLAMINE TOPICAL PATCH 1.3%, in pregnant women starting at 30 weeks' gestation (third trimester) [see Use in Specific Populations (8.1)]. Anemia has occurred in NSAID-treated patients. This may be due to occult or gross blood loss, fluid retention, or an incompletely described effect on erythropoiesis. If a patient treated with DICLOFENAC EPOLAMINE TOPICAL PATCH 1.3% has any signs or symptoms of anemia, monitor hemoglobin or hematocrit.NSAIDs, including DICLOFENAC EPOLAMINE TOPICAL PATCH 1.3% , may increase the risk of bleeding events. Co-morbid conditions such as coagulation disorders, concomitant use of warfarin, other anticoagulants, antiplatelet agents (e.g., aspirin), serotonin reuptake inhibitors (SSRIs) and serotonin norepinephrine reuptake inhibitors (SNRIs) may increase this risk. Monitor these patients for signs of bleeding [see Drug Interactions (7)]. The pharmacological activity of DICLOFENAC EPOLAMINE TOPICAL PATCH 1.3% in reducing inflammation, and possibly fever, may diminish the utility of diagnostic signs in detecting infections. Even a used DICLOFENAC EPOLAMINE TOPICAL PATCH 1.3% contains a large amount of diclofenac epolamine (as much as 170 mg). The potential therefore exists for a small child or pet to suffer serious adverse effects from chewing or ingesting a new or used DICLOFENAC EPOLAMINE TOPICAL PATCH 1.3% . It is important for patients to store and dispose of DICLOFENAC EPOLAMINE TOPICAL PATCH 1.3% out of the reach of children and pets. Avoid contact of DICLOFENAC EPOLAMINE TOPICAL PATCH 1.3% with eyes and mucosa. Advise patients that if eye contact occurs, immediately wash out the eye with water or saline and consult a physician if irritation persists for more than an hour. Concomitant use of oral and topical NSAIDs may result in a higher rate of hemorrhage, more frequent abnormal creatinine, urea and hemoglobin. Do not use combination therapy with DICLOFENAC EPOLAMINE TOPICAL PATCH 1.3% and an oral NSAID unless the benefit outweighs the risk. Because clinical trials are conducted under widely varying conditions, adverse reaction rates observed in the clinical trials of a drug cannot be directly compared with rates in the clinical trials of another drug and may not reflect the rates observed in practice.In controlled trials during the premarketing development of DICLOFENAC EPOLAMINE TOPICAL PATCH 1.3%, approximately 600 patients with minor sprains, strains, and contusions were treated with DICLOFENAC EPOLAMINE TOPICAL PATCH 1.3% for up to two weeks. See Table 2 for clinically significant drug interactions with diclofenac.Table 2: Clinically Significant Drug Interactions with DiclofenacDrugs That Interfere with HemostasisClinical Impact:Diclofenac and anticoagulants such as warfarin have a synergistic effect on bleeding. The concomitant use of diclofenac and anticoagulants have an increased risk of serious bleeding compared to the use of either drug alone.Serotonin release by platelets plays an important role in hemostasis. Case-control and cohort epidemiological studies showed that concomitant use of drugs that interfere with serotonin reuptake and an NSAID may potentiate the risk of bleeding more than an NSAID alone.Intervention:Monitor patients with concomitant use of DICLOFENAC EPOLAMINE TOPICAL PATCH 1.3% with anticoagulants (e.g., warfarin), antiplatelet agents (e.g., aspirin), selective serotonin reuptake inhibitors (SSRIs), and serotonin norepinephrine reuptake inhibitors (SNRIs) for signs of bleeding [see Warnings and Precautions (5.11)].AspirinClinical Impact:Controlled clinical studies showed that the concomitant use of NSAIDs and analgesic doses of aspirin does not produce any greater therapeutic effect than the use of NSAIDs alone. In a clinical study, the concomitant use of an NSAID and aspirin was associated with a significantly increased incidence of GI adverse reactions as compared to use of the NSAID alone [see Warnings and Precautions (5.2)].Intervention:Concomitant use of DICLOFENAC EPOLAMINE TOPICAL PATCH 1.3% and analgesic doses of aspirin is not generally recommended because of the increased risk of bleeding [see Warnings and Precautions (5.11)].DICLOFENAC EPOLAMINE TOPICAL PATCH 1.3% is not a substitute for low dose aspirin for cardiovascular protection.ACE Inhibitors, Angiotensin Receptor Blockers, and Beta-BlockersClinical Impact:NSAIDs may diminish the antihypertensive effect of angiotensin converting enzyme (ACE) inhibitors, angiotensin receptor blockers (ARBs), or beta-blockers (including propranolol).In patients who are elderly, volume-depleted (including those on diuretic therapy), or have renal impairment, co-administration of an NSAID with ACE inhibitors or ARBs may result in deterioration of renal function, including possible acute renal failure. These effects are usually reversible.Intervention:During concomitant use of DICLOFENAC EPOLAMINE TOPICAL PATCH 1.3% and ACE-inhibitors, ARBs, or beta-blockers, monitor blood pressure to ensure that the desired blood pressure is obtained.During concomitant use of DICLOFENAC EPOLAMINE TOPICAL PATCH 1.3% and ACE-inhibitors or ARBs in patients who are elderly, volume-depleted, or have impaired renal function, monitor for signs of worsening renal function [see Warnings and Precautions (5.6)].When these drugs are administered concomitantly, patients should be adequately hydrated. Assess renal function at the beginning of the concomitant treatment and periodically thereafter.DiureticsClinical Impact:Clinical studies, as well as post-marketing observations, showed that NSAIDs reduced the natriuretic effect of loop diuretics (e.g., furosemide) and thiazide diuretics in some patients. This effect has been attributed to the NSAID inhibition of renal prostaglandin synthesis.Intervention:During concomitant use of DICLOFENAC EPOLAMINE TOPICAL PATCH 1.3% with diuretics, observe patients for signs of worsening renal function, in addition to assuring diuretic efficacy including antihypertensive effects [see Warnings and Precautions (5.6)].DigoxinClinical Impact:The concomitant use of diclofenac with digoxin has been reported to increase the serum concentration and prolong the half-life of digoxin.Intervention:During concomitant use of DICLOFENAC EPOLAMINE TOPICAL PATCH 1.3% and digoxin, monitor serum digoxin levels.LithiumClinical Impact:NSAIDs have produced elevations in plasma lithium levels and reductions in renal lithium clearance. The mean minimum lithium concentration increased 15%, and the renal clearance decreased by approximately 20%. This effect has been attributed to NSAID inhibition of renal prostaglandin synthesis.Intervention:During concomitant use of DICLOFENAC EPOLAMINE TOPICAL PATCH 1.3% and lithium, monitor patients for signs of lithium toxicity.MethotrexateClinical Impact:Concomitant use of NSAIDs and methotrexate may increase the risk for methotrexate toxicity (e.g., neutropenia, thrombocytopenia, renal dysfunction).Intervention:During concomitant use of DICLOFENAC EPOLAMINE TOPICAL PATCH 1.3% and methotrexate, monitor patients for methotrexate toxicity.CyclosporineClinical Impact:Concomitant use of DICLOFENAC EPOLAMINE TOPICAL PATCH 1.3% and cyclosporine may increase cyclosporine's nephrotoxicity.Intervention:During concomitant use of DICLOFENAC EPOLAMINE TOPICAL PATCH 1.3% and cyclosporine, monitor patients for signs of worsening renal function.NSAIDs and SalicylatesClinical Impact:Concomitant use of diclofenac with other NSAIDs or salicylates (e.g., diflunisal, salsalate) increases the risk of GI toxicity, with little or no increase in efficacy [see Warnings and Precautions (5.2)].Intervention:The concomitant use of diclofenac with other NSAIDs or salicylates is not recommended.PemetrexedClinical Impact:Concomitant use of DICLOFENAC EPOLAMINE TOPICAL PATCH 1.3% and pemetrexed may increase the risk of pemetrexed-associated myelosuppression, renal, and GI toxicity (see the pemetrexed prescribing information).Intervention:During concomitant use of DICLOFENAC EPOLAMINE TOPICAL PATCH 1.3% and pemetrexed, in patients with renal impairment whose creatinine clearance ranges from 45 to 79 mL/min, monitor for myelosuppression, renal and GI toxicity.NSAIDs with short elimination half-lives (e.g., diclofenac, indomethacin) should be avoided for a period of two days before, the day of, and two days following administration of pemetrexed.In the absence of data regarding potential interaction between pemetrexed and NSAIDs with longer half-lives (e.g., meloxicam, nabumetone), patients taking these NSAIDs should interrupt dosing for at least five days before, the day of, and two days following pemetrexed administration. 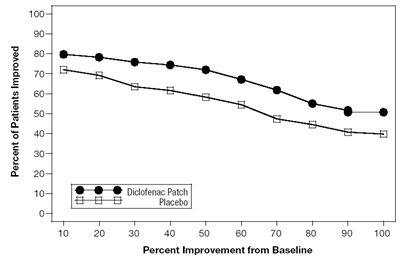 The safety and effectiveness of DICLOFENAC EPOLAMINE TOPICAL PATCH 1.3% in pediatric patients have not been established. Elderly patients, compared to younger patients, are at greater risk for NSAID-associated serious cardiovascular, gastrointestinal, and/or renal adverse reactions. If the anticipated benefit for the elderly patient outweighs these potential risks, start dosing at the low end of the dosing range, and monitor patients for adverse effects [see Warnings and Precautions (5.1, 5.2, 5.3, 5.6, 5.13)].Clinical studies of DICLOFENAC EPOLAMINE TOPICAL PATCH 1.3% did not include sufficient numbers of subjects aged 65 and over to determine whether they respond differently from younger subjects. Other reported clinical experience has not identified differences in responses between the elderly and younger patients. Symptoms following acute NSAID overdosages have been typically limited to lethargy, drowsiness, nausea, vomiting, and epigastric pain, which have been generally reversible with supportive care. Gastrointestinal bleeding has occurred. Hypertension, acute renal failure, respiratory depression, and coma have occurred, but were rare [see Warnings and Precautions (5.1, 5.2, 5.4, 5.6)].Manage patients with symptomatic and supportive care following an NSAID overdosage. There are no specific antidotes. Forced diuresis, alkalinization of urine, hemodialysis, or hemoperfusion may not be useful due to high protein binding.For additional information about overdosage treatment contact a poison control center (1-800-222-1222). DICLOFENAC EPOLAMINE TOPICAL PATCH 1.3% (diclofenac epolamine patch) is a nonsteroidal anti-inflammatory drug, available for topical application. DICLOFENAC EPOLAMINE TOPICAL PATCH 1.3% is a 10 cm × 14 cm patch comprised of an adhesive material containing 1.3% diclofenac epolamine which is applied to a non-woven polyester felt backing and covered with a polypropylene film release liner. The release liner is removed prior to topical application to the skin.The chemical name of diclofenac epolamine is 2-[(2,6-dichlorophenyl) amino]benzeneacetic acid, (2-(pyrrolidin-1-yl) ethanol salt, with a molecular formula of C20H24Cl2N2O3, and molecular weight 411.3, an n-octanol/water partition coefficient of 8 at pH 8.5, and the following chemical structure:Each adhesive patch contains 180 mg of diclofenac epolamine (13 mg per gram adhesive) in an aqueous base. It also contains the following inactive ingredients: 1,3-butylene glycol, dihydroxyaluminum aminoacetate, disodium edetate, D-sorbitol, fragrance (Dalin PH), gelatin, kaolin, methylparaben, polysorbate 80, povidone, propylene glycol, propylparaben, sodium carboxymethylcellulose, sodium polyacrylate, tartaric acid, titanium dioxide, and purified water. Diclofenac has analgesic, anti-inflammatory, and antipyretic properties.The mechanism of action of diclofenac, like that of other NSAIDs, is not completely understood but involves inhibition of cyclooxygenase (COX-1 and COX-2).Diclofenac is a potent inhibitor of prostaglandin synthesis in vitro. Diclofenac concentrations reached during therapy have produced in vivo effects. Prostaglandins sensitize afferent nerves and potentiate the action of bradykinin in inducing pain in animal models. Prostaglandins are mediators of inflammation. Because diclofenac is an inhibitor of prostaglandin synthesis, its mode of action may be due to a decrease of prostaglandins in peripheral tissues. DICLOFENAC EPOLAMINE TOPICAL PATCH 1.3% applied to intact skin provides local analgesia by releasing diclofenac epolamine from the patch into the skin. The DICLOFENAC EPOLAMINE TOPICAL PATCH 1.3% is supplied in resealable envelopes, each containing 5 patches (10 cm × 14 cm), with 6 envelopes per box (NDC 59762-0411-2). Each individual patch is embossed with "GREENSTONE 1.3%". Each patch contains 180 mg of diclofenac epolamine in an aqueous base (13 mg of active per gram of adhesive or 1.3%).The product is intended for topical use only.Keep out of reach of children and pets.Envelopes should be sealed at all times when not in use.Curad® Hold Tite™ is a trademark of Medline Industries, Inc., and Surgilast® Tubular Elastic Dressing is a trademark of Derma Sciences, Inc.
StorageStore at 20ºC to 25ºC (68ºF to 77ºF); excursions permitted between 15ºC to 30ºC (59ºF to 86ºF) [see USP Controlled Room Temperature]. Advise the patient to read the FDA-approved patient labeling (Medication Guide) that accompanies each prescription dispensed, as well as the Directions for Use on the product packaging. Inform patients, families, or their caregivers of the following information before initiating therapy with DICLOFENAC EPOLAMINE TOPICAL PATCH 1.3% and periodically during the course of ongoing therapy.